In 2015, Cashmio was originally established by two Scandinavian entrepreneurs who have developed their business experience through many portals. From being an online gamer themselves and working well with other managers in the field, they have developed the knowledge necessary to run their gaming site. Today, they strive to give gamblers the thrill and excitement of a real live casino experience. Cash Mio online casino games are put together so a player can have a great time without having to travel for gambling. However, if your lifestyle has you on the go, there is no need to worry because they are also mobile accessible. This site offers simplified English wording, so not only can you easily navigate through all of the games but also comprehend the settings more efficiently. Cashmio is designed to be used with little effort so you can quickly move to the gambling game of your choice. To get started, just signup, make a deposit, and you're ready to start enjoying the entertainment part of this site. The Cashmio site was established in Malta and is mandated to follow the rules and regulations of the European Union, not to mention, how secure and safe the site is required to be. Meaning, the site is on the level and ensures your privacy without question all the time. Based on the information posted on their site, security is exceedingly respected and valued, with more awareness and concern than most banks. When you visit Cashmio, you will see bonuses and promotions that they offer as well as a list of games to play. Cashmio has a fabulous platform design that makes their online casino games sound as if you’re playing on a real live casino floor. They provide a list of favorite games, new games, daily missions, and jackpots that are available to play. With this gaming site, you have the opportunity to win coins for everything that you do. Every card game, every bet, and every electronic slot will bring you one step closer towards earning free stuff. In addition to receiving free coins, you will be given a bonus by signing up as a new member on their site. However, you must make your first deposit a minimum of €20 to qualify. Not only can you take a different mission every day but earn more bonus coins when you complete the mission. In fact, this site offers a total of three missions a day to choose from with no limited restrictions. Meaning, you can play all three and have more chances to win free coins. 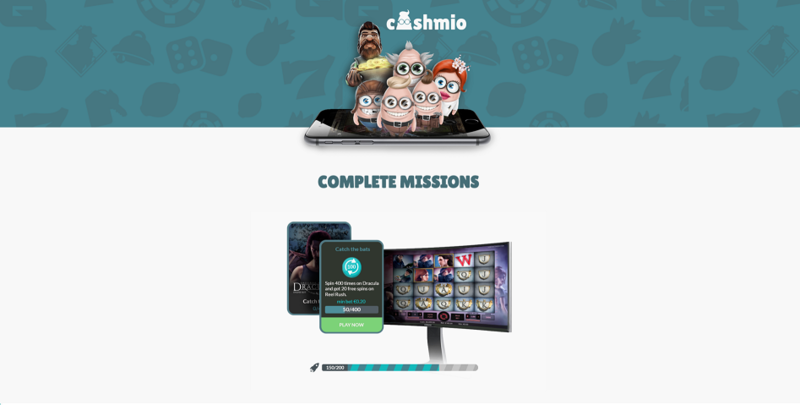 Cashmio has made it possible to take the gambling fun with you while you’re on the go. To make this possible, they took their site to the next level and went mobile. In fact, you will have the same access on your mobile device as you do on your desktop. There is no downloading required; just visit Cashmio on your mobile device of choice and log into your account. When playing on this site from your mobile device, you will not experience any lagging that usually occurs with other casino sites. Cash Mio has made this possible by customizing their website's platform to adjust to your mobile device automatically. Cashmio offers many different categories for their games such as Blood Suckers, Immortal Romance, Dracula, and Lost in Vegas. This site offers a large variety of slots to play; in fact, there are well over 700 to choose. Cash Mio is geared towards those gamblers that enjoy playing the slots. Here on this site, you can try your luck with games like Lucky Leprechaun, Lucky Witch, or the Lucky Angler. On the other hand, maybe you would rather go wild with the Wild Rockets, Gorilla Go Wild, or Super Wilds. Not only are these excellent slot game choices but they can also bring you to the edge of your seat with their enticing ways to win some real cash. Perhaps you’re the type of gambler that would practical jump through hoops to enjoy the classic slots. If so, you will enjoy the Classic 243, Medusa, or Legends of Africa. No matter which style of slot games you choose, the opportunity to win great prizes and cash rewards will be available to you. All deposits on this site are instant. However, depending on which method you use there may be a charge. Some of the ways that you can utilize are Visa, MasterCard, Trustly, EU Teller, P24, and more. Making withdrawals from this site can be done through a Visa, Trustly, Neteller, and more. It can take up to 24-hours for the withdrawal to process. If you choose to use a bank transfer option, then it can take up to one to five business days for any given transaction to process. Cashmio provides their gamers with 24-hour support. They can be contacted through a live chat stream or emailed at [email protected] For added convenience, they offer a frequently asked questions area that can help answer a general question that a user may have.